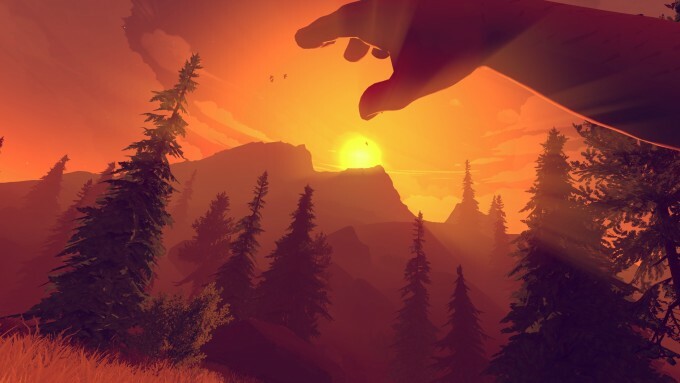 It’s hard to describe a game like Firewatch, but as we’ve found, it’s not at all hard to recommend. This much-hyped indie title packs an intriguing, well-told story, and gorgeous, atmospheric environments. The entire package makes for an immersive experience that will be hard to forget about after the game is completed. I was introduced to Firewatch only a week ago, after a friend told me that it was about to launch. What made the game stick out in his mind is that the folks over at Giant Bomb have been using it as a bit of a joke because it’s so hard to describe. It might be easier to explain what the game isn’t rather than what it is. 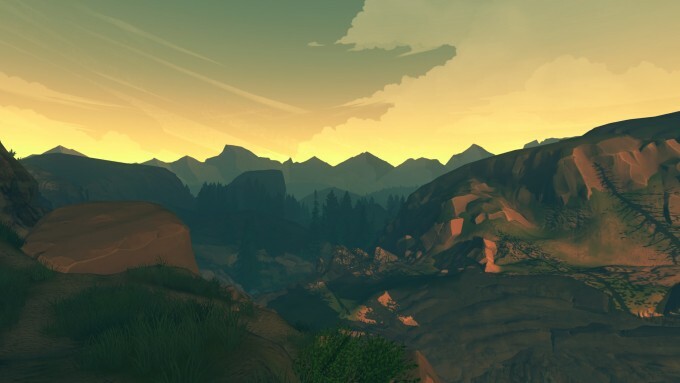 Firewatch isn’t a game that requires much skill-level. There are no enemies to combat, no precise movements to be made, and no inventory to manage. If that makes it sound like the game lacks depth, it’s true. But the game isn’t supposed to have depth; it’s supposed to tell its story in an interesting way while immersing you with great atmosphere. You assume the role of Henry, a man who’s been handed some bad cards in life and has decided to “run away” from his problems by volunteering for a job at Shoshone National Forest as a fire lookout. Being a fire lookout is an interesting job; you’re out in the middle of nowhere, with minimal contact with the outside world. Henry doesn’t browse the Internet to pass the time; he reads books and taps notes into his typewriter. Minutes into the game, you’ll be introduced to your supervisor, Delilah, who you get you know pretty well over the course of your adventure. She sits in a watchtower of sorts that’s visible from most areas of the game. From her perch, Delilah can monitor all of the lookouts in the region, but ultimately, it’s yours – and you in particular – that she seems most interested in. If you prefer game dialog to be kept to a minimum, Firewatch might be worth avoiding. Much of the game revolves around conversations between you and Delilah; there’s small talk and heart-pouring conversations, as well as panicked back-and-forths, as you both work to deal with problems that permeate through the park. As someone who could take or leave the story in most games, I admit that 10 minutes into Firewatch, I didn’t think I’d enjoy it. But, after a two-hour game session and bedtime looming, it was difficult to pull myself away. I went to sleep that night thinking about the game, trying to piece what I learned up to that point together. The next night, I finished it not once, but twice. After completing the PlayStation 4 version, I moved over to the PC version to have a second go-through; this time choosing different chat options to see how things would differ. While I enjoyed hearing different lines the second go around (and in some cases learning even more about certain things), I found it a little disappointing that the chat options are unimportant. It doesn’t matter whether you try to keep conversations with Delilah on a positive note or a sour one – the game and goals are accomplished just the same. That’s not ideal, but something that helps make up for it is the fact that the voice-acting is simply superb. That’s one thing that helps with immersion; the conversations more often than not sound completely natural, with minor mannerisms most voice-actors don’t seem to nail down in video games being nailed-down here. The voice behind Henry is Rich Sommer, known for his role as Harry Crane in Mad Men. Delilah is voiced by Cissy Jones, someone who’s done voice work for dozens of games, including Fallout 4, Wildstar, Rift: Nightmare Gate, and The Walking Dead: The Game. After completing the game not once, but twice, I can assure you that Sommer and Jones were great choices. For much of the game, Delilah sends you from point A to point B to figure something out. The game doesn’t do too much hand-holding to help you find out where you should go next; instead, you are given a detailed map as well as a compass. Even as someone who’s comfortable with finding the right path to take, I did find the process to be a little tedious in Firewatch. With a map out, you have to hit a key to zoom in, but that doesn’t cause it to fill the screen. Instead, you are simply hand-holding the map and must use the key to zoom in and then move around it. It’s a bit clunky, but I feel the developers wanted the process of finding out where to go to be more realistic, and perhaps more rewarding than it’d otherwise be. As all of these screenshots show, Firewatch has no static UI. If you pick up an item that you can use later, you’ll see an icon noting that for a few seconds, but then it goes away. At any given time, you’ll have a small circle target in the middle of the screen, allowing you to target things to pick up. Because the game is so lush and colorful, I’ve Photoshopped out the target in all of the screenshots here in case someone wants to use one as a wallpaper. 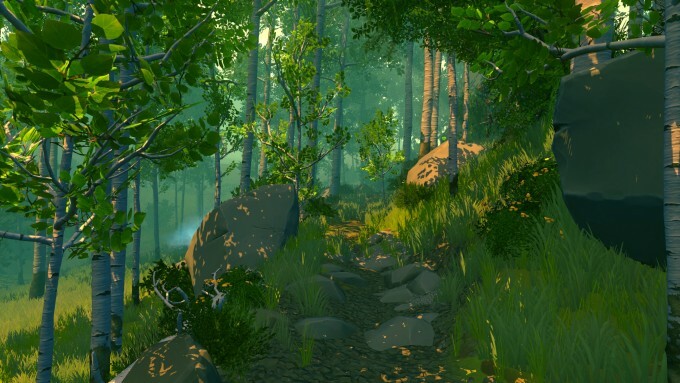 Firewatch might not have the graphical prowess of a Far Cry, but it looks fantastic in its own right. Someone told me the game reminded them of Team Fortress 2, and perhaps that’s a fair comparison. 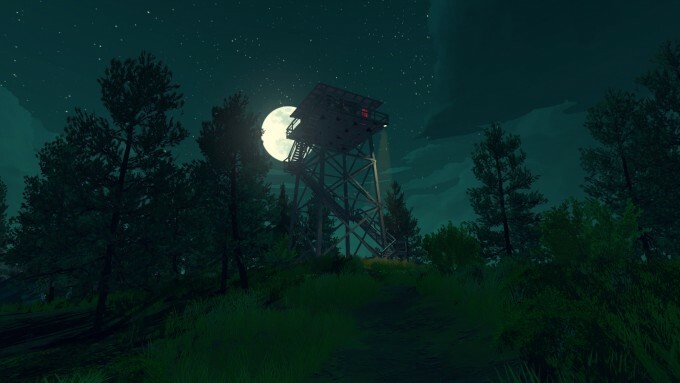 Static images don’t do much to show Firewatch‘s true beauty off, so I’d recommend checking out an official trailer to get a better feel for it. I had thought about including self-shot video here, but I didn’t want to risk spoiling something. This is just a 3 or 4 hour game, after all. “3 or 4 hours?? ?” Yup – and for $20, no less. At first, I thought that was quite expensive, but I backtracked on that once the game was over, and I realized what kind of experience it had given me. The ending is not going to be for everyone, in that it’s not much of an ending at all – so fair warning. It seems to me that the game is left a little open-ended, as if Firewatch‘s success will decide whether or not we get DLC, a sequel, a tie-in, or similar game in the future. I played through the game twice in two days, so that should speak enough about how much I enjoyed the game. Because I was able to play both the PlayStation 4 and PC version, I can comment on some of the differences. As you’d expect, the performance of the PS4 version doesn’t hold a candle to the PC version. In fact, that particular version is having issues right now that are affecting a lot of people. Poor FPS performance and random stutters are among the big complaints. In my personal case, I found some of the stuttering to give me sudden but brief headaches. 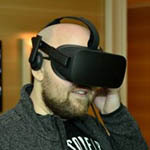 The developers acknowledge the issue, and are working “around the clock” to fix it. On the PC, at least with decent hardware, the game ran beautifully. This is a game that, to me, deserves 60 FPS, and the PS4 can’t deliver that. I played the game “side-by-side” (same monitor, both running at the same time), and the differences were stark. Even as someone who’s warmed up to consoles since getting the PS4 in December, I can’t ignore how poor the PS4’s performance is versus the PC version of the game; it’s like night and day. That console-shaming aside, I think Firewatch is a game that should be played by anyone (adults recommended, per the devs) who yearns for a game that’s a bit more laid-back and tells a story in an interesting and entertaining way. You don’t need much skill to complete the game, and in fact, if you merely complete it, you’ll automatically have all 5 of the game’s achievements. It can be played by anyone. The roughest part is following the map, but a little patience will quickly soothe that pain. Firewatch is a game I hadn’t even heard of until a week ago, but now I am glad I didn’t end up overlooking it. Even after the second completion, I didn’t feel “done”. I went to message boards to read what others thought about the game and its story, which in itself opened my eyes to things I didn’t catch or think about, causing me to ponder a third playthrough. Interesting gameplay that’s simple to learn. The world’s atmosphere is fantastic, both visually and audibly. Voice acting is top-rate. Some of the best I’ve ever heard in a video game. Short, but great story. You might just get a case of the feels. There is a lot of dialog to listen to – not everyone will dig this. Gamers will likewise have differing opinions on the game’s ending. The game is 3 hours long if huffed through; 4~5 if you really take your time and explore.